Dustin and the welcoming committee At the same time Pittsburgh was celebrating their first ever win in a new arena, Wilkes Barre was off spoiling another. Dustin Jeffrey scored twice to lead WBS over the Checkers in their first ever home game in Charlotte. Jeffrey's 2 goals were nearly polar opposites, with one methodically coming on the powerplay and the other from a shorthanded opportunity. Joe Vitale added an important insurance goal, and Steve Wagner scored the 4th to ensure the Pens would stay ahead comfortably. 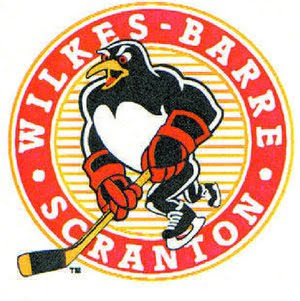 This was a much cleaner game for WBS than on Tuesday, with only a few minors here and there being called. They call themselves the checkers? gay.